Following the Jasmine Revolution in Tunisia in mid 01/2011 and EGYPTS REVOLUTION in early 02/2011 a wave of protests and demonstrations flooded the Arab world in the Middle East and North Africa – the Maghreb. The most violent are the unrests in Libya, Yemen and Bahrain. In Libya there was always a sort of internal tension between Benghazi, the second largest city in Libya and the capital of the Eastern Provinces known as Cyrenaica, with a different history heritage and the western provinces of Tripolitania where the Capital Tripoli is located. Indeed most of the unrest breached out in Benghazi while the west of Libya, Tripolitania, remained under control. Yemen was united as one state after a bloody Civil war in 1993 between South Yemen, the former British colony of Aden and North Yemen, the historical kingdom of Yemen. Since the forced merger South Yemen was always a hotspot of all kinds of opposition to Sanaa administration in the North and a separatist movement is popular in the South. The unrest in Yemen just reflects the internal conflicts in the country. Unlike Yemen or Libya, where the unrests are totally a reflection of internal problems Bahrain unrest reflects regional crisis. Bahain has a population of about 1,250,000, out of which more than 660,000 are not citizens. Although Bahrain original citizen and the Al-Khalifa ruling family are Sunnis the Shiites, almost all of them emigrated from Iran in the last 50 years, are already a majority in the country. Furthermore Bahrain is located just near the rich oil fields of the Gulf Emirates and Saudi Arabia and the big Saudi oil terminals of Dammam and became therefore a strategic point for Iran in its effort to become a regional hegemony power (see also – M. Star Attack ). Iranian legal institutions and commercial companies are located in Bahrain and operate with and within the majority Shiaa population affiliated to Iran. No doubt that Iran established a network of Iranian sympathizers all over the tiny monarchy of Bahrain. King Hamad Bin-Khalifa of Bahrain reportedly said, in 07/2008, that Bahrainis were receiving training from Hizbullah in Lebanon according to a cable released by Wikileaks and published in The Guardian newspaper on 02/16/2011. Bahrain is on the front line between Suuna and Shiaa in the Middle East and Between Iran and the pro-American regimes in the region. Following the collapse of Saad Hariri’s regime in Lebanon in 01/2011 (see – American Setback) and the removal of the pro-American Mubarak’s regime in Egypt a week ago, a political vacuum was created in the pro-American block in the Middle East and it is Iran which rushed to fill the vacuum. The demands of the Bahrain’s protesters have two main objectives: force the Sunni monarchy to give up its control over high-level government posts and all critical decisions, and address deep grievances held by the country’s Shiites, who make now up 70% of Bahrain’s 550,000 citizens. Unlike Yemen and Libya in Bahrain the unrest reflects much more regional tensions rather than Bahraini internal tensions. It reflects the struggle between Shiaa Iran and the former pro-American Sunni Arab countries in the Middle East. For Saudi Arabia, the Gulf Emirates and Bahrain itself the unrests were not socially motivated but Iranian effort to take advantage on the Middle East situation. 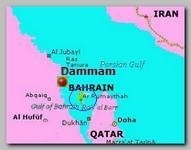 No wonder they used military power, on Thursday 02/17/2011, to regain control on Bahrain.